Time for part two of my discussion of BFC Financial and BBX Capital, two related and complex companies. These companies possess significant value in the form of cash, loans, and real estate, shared ownership of a very valuable timeshare company, Bluegreen, and over one billion in NOLs. Due to the complicated ownership structure and a litigation overhang, the market has priced these companies at a massive discount to a conservative reckoning of their assets and earnings power. In part one, I estimated BBX Capital’s valuation at $631.6 million, or $39.46 per share. Valuing BFC Financial is actually a little easier. BFC’s value consists of some corporate cash, its 51% stake in BBX Capital, its 54% stake in Woodbridge/Bluegreen, and its NOLs. 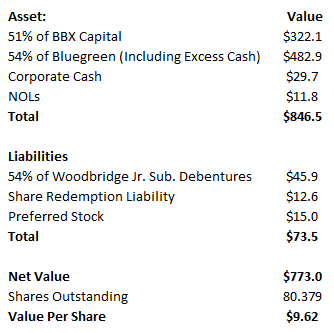 Since I already examined the value of BBX and Woodbridge/Bluegreen in the previous post, all that remains is to analyze BFC’s corporate cash and NOLs. Due to consolidation, BFC’s balance sheet looks much more complex than BBX Capital’s. The liabilities are much the same. The BB&T interest belongs to BBX’s FAR, LLC and the notes payable are Bluegreen’s, as are the junior subordinated debentures. (As discussed in the last post, $85 million worth of the debentures are Woodbridge obligations.) That leaves only the deferred taxes, share redemption liability, preferred stock and the ever-mysterious “other liabilities.” With the exception of the share redemption liability and the preferred stock, it’s somewhat unclear exactly what amount of “other liabilities” and deferred income taxes are obligations of BFC versus Woodbridge/Bluegreen or BBX. I don’t believe that BFC’s other liabilities require any ongoing cash flow to service or amortize, making them largely irrelevant to this valuation. BFC possesses over $300 million NOL state and federal NOLs. However, around $80 million are limited by the company’s 2013 merger with Woodbridge. Estimating value of the NOLs is tough because BFC doesn’t reveal how much are state and how much are federal. For that reason, I’m ignoring their value entirely, even though they are certainly worth something. For the NOLs, I am including only 54% of those of Woodbridge and Bluegreen, which I value at $12 million using very conservative estimates. 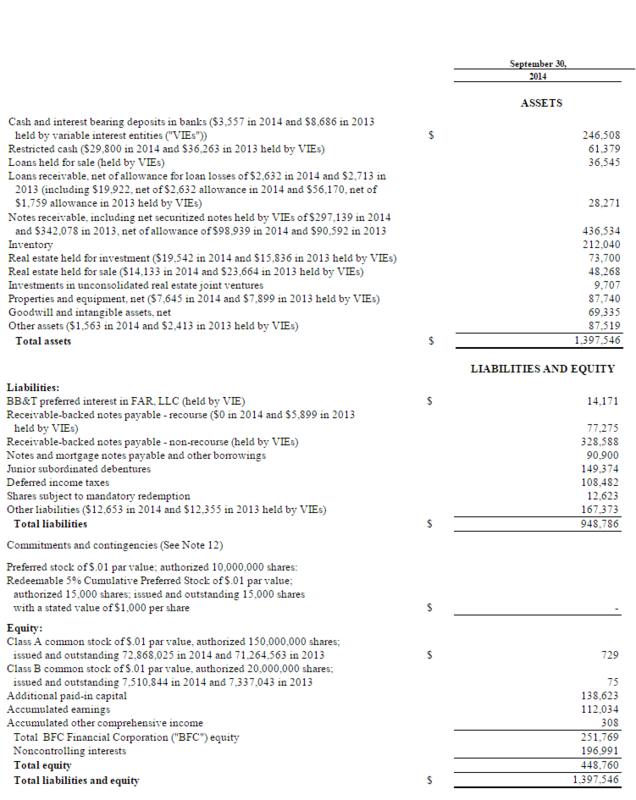 All that’s left is to add up the values of BFC’s assets and liabilities. I estimate the value of BFC shares at $9.62. Just like with my BBX estimate, this value is intended to be conservative and could be markedly higher if Bluegreen is worth more than 8x pre-tax income, or the companies utilize their net operating losses well. So why, if these companies really possess so much value, are they trading at 35%-40% of my estimates? It all comes back to one thing…. The CEO of both BFC Financial and BBX Capital is Alan B. Levan. Mr. Levan is a colorful character, to put it lightly. As chief of BFC Financial and BBX, he’s pulled off a number of successful deals and transactions, but he’s also managed to anger many minority shareholders in businesses he has purchased. On more than one occasion, these shareholders have brought lawsuits. In 2012, the SEC brought charges against Levan his actions during the financial crisis. The SEC alleged Levan and BankAtlantic had failed to write down loans in distress and had made misleading statements about the company’s financial standing to investors. As is typical for cases like this, the SEC and company attorneys battled in court for months and filings flew, but the case gradually crept forward. In the meantime, Levan revealed plans to merge BBX and BFC Financial together, with BBX Capital shareholders receiving 5.39 shares of BFC for each share of BBX. Following the transaction, BFC would uplist to a major exchange. The benefits to shareholders would be significant. No longer would investors have to look at two different companies to see the value of Bluegreen, and no longer would each company’s balance sheet show many confusing items and minority interests. With better visibility, clearer financials and an increased market cap, it’s not hard to imagine a new set of investors coming on board and pushing the share price upward. With the planned merger in progress, the SEC’s case moved to trial. A summary of the SEC’s case and the counts against BBX and Levan can be found here. The trial took six weeks, but just last week the jury made its decision: guilty. The monetary penalties won’t amount to much. The maximum civil penalty to BBX Capital for each charge is only $500,000. And there’s even a chance the decision will eventually be vacated. Previously, a judge reversed a jury’s finding on private litigation brought on roughly the same issues. The company’s statement in response to the guilty verdict is here. Though the monetary cost of the guilty verdict is small, the harm to shareholders is large, for a few reasons. First, the planned merger between BFC and BBX is off for the time being. This means markets will continue to be presented with two complex and confusing entities, and will likely continue to undervalue them. Second, Levan and the companies will undertake an expensive and drawn out appeals process, which could result in years of legal fees and continued uncertainty. Levan seems to honestly believe himself above reproach in his conduct, and will fight hard to be allowed to continue to lead his companies. So, investors in both BBX and BFC may have to exercise some patience. Their disappointment with the verdict and the merger cancellation are obvious by the share price movements, but the values of the company’s assets are unchanged and growing. The litigation will eventually be resolved (with or without Levan remaining at the helm) and the companies will be merged or otherwise resolved into one entity. Assuming leadership avoids any disastrous decisions and the economy in general avoids a financial crisis redux, patient shareholders should eventually realize an excellent return from today’s share prices. Alluvial Capital Management, LLC holds shares of BBX Capital Corporation and BFC Financial Corporation for client accounts. Thanks for your work. As I mentioned in your first article I was surprised they cancelled the merger considering the judge hasn’t decided on the penalties yet. I don’t think the company would appeal a monetary fine (at least that was my impression based on discussions with investor relations), but obviously would battle tooth and nail if Levan gets barred. I don’t think an appeal would take years. A year possibly. The shareholder trial I believe was decided on by the appeals court after about 6 months. I don’t think either side would have many options after that. I’m hoping in the meantime they will announce some buybacks. As you’ve mentioned they have plenty of excess cash. Yes, buybacks would help the case quite a bit. And hopefully the legal process is over relatively quickly, but I’m prepared for the worst. Even if it does take quite some time, the value is there and growing and I can wait. Do you know of any dividend is in the works of any of the two companies? There’s no history of any, no? A dividend is doubtful. These companies has always focused on growing, and the strange structure makes upstreaming dividends from subsidiaries more of a hassle than it needs to be. Cynical Take: there will be no dividends. Any dividends must be shared fairly with minority shareholders. Any funds left in the company can be used to increase the value of the company, which should result in an increased stock price (from which all shareholders benefit). However, the equity incentive options management keep issuing to themselves only grow in value if the money is kept in the company, not dividend out. Allows them to keep extracting value from minority shareholders. You have mentioned that the value is growing. By how much did the value increase between last year and this year from your estimate ? How much do you think it will increase in 2015 likely ? Asking just for the worst case scenario where there is 5 more years before the effective merger. I don’t think 5 more years is realistic. There is only so long the legal battle can continue. In the meantime Bluegreen is a cash machine throwing off $60M+ per year and they should be able to continue to grow the business. BBX is just in the beginning innings of monetizing their real estate. They have formed a number of joint ventures (apartments, home building, office space, etc.) so you should see revenue ramp up over the next few years. You’ll also see some land sales which they should be able to sell for a nice amount over book value. I agree with OTC that a dividend is unlikely. Maybe some buybacks, but most of the money will probably be plowed back into the company. Levan might be a little full of himself, but he is actually a pretty shrewd businessman. I think the relevant question is whether Bluegreen will remain a cash machine throwing off the same amount for years and years. Time-sharing is a very cyclical business. Take a look at the last cycle. Agree with analysis on BBX, but again, if Florida real estate takes another dive, then I’m not sure they’ll be realizing more than book value on any sales. Most businesses are cyclical based on macroeconomic factors. The last cycle happened to be during the Great Recession. I don’t think too many businesses got through that unscathed. Bluegreen also changed their business to the capital light model which greatly reduces their exposure to losses during a downturn. As for South Florida real estate the conditions here are quite good (I live in Palm Beach). Land is scarce and the population is growing (especially as the baby boomers retire). We are far from the prices during the real estate bubble. The capital outlay for the candy companies was quite small compared to the overall size of the company. I spoke to investor relations about this and he told me Hoffman’s was a long time customer of Bank Atlantic. The person who owned was looking to retire and get out of the business and BBX felt they got a good deal. After that purchase other companies approached them. They feel there should be some good synergies between the businesses – increased buying power, cross marketing, reduction in G&A. They might even consolidate the production. They think the businesses will be a good investment whether they keep them or sell them down the road. The one thing I did find amusing is when he told me that Berkshire Hathaway has a candy business. I wonder if Levan really compares himself to Buffet. I don’t know if they have intention of making any big purchases, but then again the company’s value today is based on some savvy moves made by Levan (Bluegreen and some ‘bad assets’ left over from the Bank Atlantic sale). Hopefully his age and past experiences prevent him from doing anything too radical. I agree that it COULD be a great move, but it’s exactly such Berkshire/candy statements that give me pause. Management has limited capital and attention, and I wonder whether they tend to get distracted by the next new shiny thing. If candy is immaterial why are they devoting time to it? Even if the business has a attractive economics AND they have an articulated vision of how to capture them, does the purchase and integration process pay off in terms of opportunity costs? Levan & co. are smart operators, but even after the 8x+ return of the last 5 years, they’re trading at less than half of what they were pre-crisis (as are many others). You can see this as a sign of good things to come, or as an indication of risk. I mean this only as something to watch for. If Levan took the FAR/BXG proceeds and bought an aquaculture company, an auto parts shop, an app developer and a citrus grove, I would probably bail. Aharon – I hear you. FYI I didn’t say the candy business was immaterial. I’m just saying they didn’t spend a lot of money on it (compared to the size of the company). That said if they feel they can get a reasonable ROI I think it’s fine. Obviously if they go out and make a large acquisition it will grab my attention, but I’ll deal with that as it comes. In the meantime I own the company because it’s dirt cheap on fundamentals and sooner or later I think that will resolve itself. Agreed! And I own it for the same reasons. The “immaterial” language was, I think, from their most recent presentation. It’s an interesting direction, anyway; what they’re really buying with the candy cos are intangibles of brand and distribution. By happenstance or design, that resembles the new Bluegreen. It’s a transformation from BFCF’s old assets, which were more capital-intensive: home building, old Bluegreen, restaurants, office supply retail, banking (though you could argue that banking is capital-light because it’s equity-light) etc.–though maybe not directly comparable because these were not all control assets. The new RE JVs also represent, generally, contribution of land with smaller capital commitments; if their direction going forward is toward an asset-light/unload/high cash flow model, I think we will all be very well rewarded. What if they bought a closet door company? They did that: Renin. 1. Shouldn’t you capitalize the G&A expenses at BFC? It was $17.7M in 2014 and put a 10x multiple that’s $177M of negative value. 2. Did you take account of Bluegreen’s noncontrolling interest (Bluegreen does not wholly own all its resorts) of $11.4M in 2014? NCI was higher in 2012-13. 3. The diluted share count is higher than outstanding shares. 4. Any thoughts on the tender announced today? I don’t think there’s much BBX shareholders can do to get a higher bid here. The tender should be very accretive for BFC even at $20. I think BFC is the better play here. If we consider 1-3 above I actually get a BFC valuation that’s substantially lower ($5 – $6 range). Post the tender, NAV probably increases by ~$0.5/share. I don’t know if BFC is that attractive given that the company probably deserves to trade at a discount (holding company, questionable stewardship, litigation, dual class shares) and it may take a long time for price to converge to value. Though this tender may be the event that catalyze the stock. Just a quick note re: BBX offer. Currently own both BBX and BFCF. Is there benefit to tendering BBX shares at estimated 50% of intrinsic value to BFCF or is it more advantageous to hold on? Your thoughts? Thx. Enjoy your blog very much, always thoughtful. By my estimates, the tender offer increases BFCF’s value per share by $1-$1.50. The only benefit to tendering is getting $20 for your BBX shares, which of course is more than they trade at right now. What I expect many will do is tender their BBX shares and then buy back in with the proceeds. What do you think will happen with BBX price the day after finished tender? Do you think that all opportunists who purchased BBX only to accept the tender offer will sell the remain shares that have not entered the tender and may be we see a sell off to levels 15 usd? Here is another data point that shows BV is understated. As far as the tender, my base scenario is that 70% of shares are tendered as some shareholders will not participate for various reasons (don’t understand, don’t realize, etc). In that scenario, I keep all my shares. I think there are many shareholders like me who bought extra shares, knowing that they could tender. The other scenario that I think has a low probability is that all of my shares are tendered and there is no pro-ration. I think this is unlikely but possible as some shareholders have large capital gains and it may not be worth the payment of capital gains to realize the $1-$1.10 (at current price of $18.90 today). This scenario assumes that you think BBX is worth much more (which I do) and I would then be buying new shares, potentially above $20. You nailed it! 70% almost on the dot. Thanks OTC. Final pro-ration factor was 72.57569% so I bought a few more shares today since my base case was 70%. BFC could really use some activist pressure / engagement. Same old BS from management. Complete disregard of shareholders. Stock sitting at 2013 levels despite improved business. No word on merger and uplisting. Hard to apply activist pressure when Levan and Abdo own a controlling stake in the voting shares. That said now that all the legal issues are mostly out of the way other than the appeal hopefully things will improve. They should report very soon and I expect a strong Q between Bluegreen and some nice real estate sales. Would be nice to see them buying back share at these prices. Every time there is a dual ownership structure, minority shareholders are playing with weak hand, which in BFCF was the case in the last few years, based on share price staying put. In light of just announced merger, I’m trying to handicap the odds of BFCF putting BlueGreen on the block and creating a value unlocking event. Clearly, it’s all in the hands of the Levans (Senior and Junior) + Abdo. According to the latest DEF14A, between the 3 of them, they get paid some $25m/yr, give or take. Does anyone have their pro forma share ownership, once the merger is complete? In other words, I’m trying to find out what their joint share count will be, and how much will they gain for each $1 appreciation in the BFCF. Based on that it will help me figure out if stock price appreciation will quickly increase their wealth, or if they are better off staying put and milking their $25m/year, without too much concern for the stock price and their minority partners. Much appreciated! 100% agree, I’ve been waiting more than 2 years, at the end the patience always is rewarded.